Author(s): Pavlos Msaouel, Albert Einstein College of Medicine, Jacobi Medical Center, Suite 3N1, 1400 Pelham Pkwy S., Bronx, NY 10461, USA. Jose Nahun Galeas, Alejandro Recio Boiles, Ramiro Rancier Ruiz, Michael Koutsilieris. Metastatic castration-resistant prostate cancer (mCRPC) is universally incurable and represents an area of substantial unmet medical need. Novel targets and therapeutic strategies have emerged based on an improved understanding of the crosstalk between prostate cancer cells and the bone microenvironment. A wide variety of signaling systems including the RANKL/RANK/OPG, IGF-I, FGF and Wnt:DKK-1 pathways can be targeted to suppress tumor growth and treatment resistance. Antisurvival factor therapy can increase the efficacy of standard antineoplastic regimens by targeting biologic molecules acting as “survival factors” within the bone microenvironment. Novel agents can also be used to mobilize the host immune system to attack prostate cancer cells. Clinical testing of these therapeutic approaches has produced encouraging objective clinical responses in subsets of patients with mCRPC. The present review summarizes data regarding the emerging strategies used to target the bone microenvironment in mCRPC. Keywords: Bone metastasis, castration-resistant prostate cancer, tumor microenvironment. Affiliation:Albert Einstein College of Medicine, Jacobi Medical Center, Suite 3N1, 1400 Pelham Pkwy S., Bronx, NY 10461, USA. Keywords:Bone metastasis, castration-resistant prostate cancer, tumor microenvironment. Abstract:Metastatic castration-resistant prostate cancer (mCRPC) is universally incurable and represents an area of substantial unmet medical need. Novel targets and therapeutic strategies have emerged based on an improved understanding of the crosstalk between prostate cancer cells and the bone microenvironment. A wide variety of signaling systems including the RANKL/RANK/OPG, IGF-I, FGF and Wnt:DKK-1 pathways can be targeted to suppress tumor growth and treatment resistance. 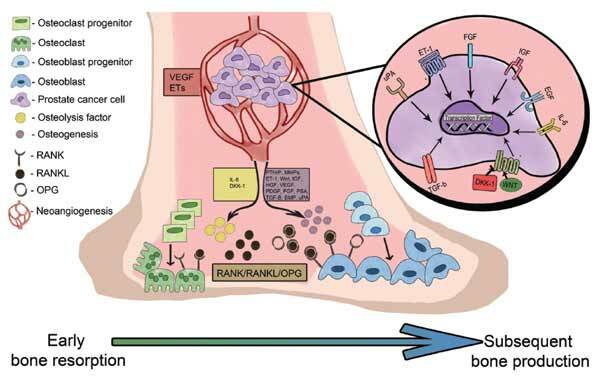 Antisurvival factor therapy can increase the efficacy of standard antineoplastic regimens by targeting biologic molecules acting as “survival factors” within the bone microenvironment. Novel agents can also be used to mobilize the host immune system to attack prostate cancer cells. Clinical testing of these therapeutic approaches has produced encouraging objective clinical responses in subsets of patients with mCRPC. The present review summarizes data regarding the emerging strategies used to target the bone microenvironment in mCRPC.